The high-pitched screech of the Blue Jay fills the autumn air as these colorful relatives of the crow gather nuts. Their loud calls are no doubt warnings for others to keep away. The cries often mimic hawks, thus frightening others into thinking a predator threatens. Writer Edwin Way Teale observed that not only birds, but also squirrels, muskrats, and rabbits hide when they hear the war-cry of a Blue Jay. For the jay, that’s important. Like the squirrels, jays collect and store nuts for winter dining. In fact, they far outstrip the Gray Squirrel in nut-gathering capacity and in the process, wind up planting more trees than their furry neighbors do. Naturalist M. R. Chettleburgh found that during the single month of October, 30 to 40 jays can gather and plant more than 20,000 acorns, hauling them up to three-quarters of a mile from the mother tree. 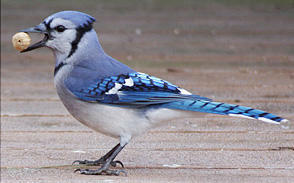 Thus, the jay has learned that to win in the war of food gathering, you’ve got to talk tough, not necessarily be tough. You might consider him a politician of the bird world.